National Security Agency (NSA) personnel rotated in and out of a U.S.-operated “Mexico Fusion Center” located inside the U.S. Embassy in Mexico City and provided additional analytic support to the secret intelligence facility’s “high value targeting” mission, according to a 2010 Defense Department (DOD) memorandum obtained by the non-governmental National Security Archive through the Freedom of Information Act. The document is perhaps the most detailed and up-to-date declassified account available of Pentagon intelligence programs in Mexico during the last few years. The memo also deepens our understanding of recent U.S. espionage activities in Mexico that came to light as a result of a cache of documents leaked to journalists by former NSA contractor Edward Snowden. What emerges are the outlines of a two-track U.S. intelligence program: one, a network of joint intelligence centers staffed by personnel from both countries; the other, a secret facility located inside the U.S. Embassy to which the Mexicans are not invited. U.S. security assistance to Mexico has skyrocketed under the Mérida Initiative, a $1.9 billion U.S. security package approved in 2008 and aimed at curtailing drug trafficking and related criminal enterprises in Mexico and Central America. The memo was released in response to a FOIA request for documents relating to DOD aid to Mexico under the National Defense Authorization Act from 2008-2012. The document describes support provided to the Mexico Fusion Center by the Pentagon’s office for Counternarcotics and Global Threats (CN&GT). NSA officials worked inside the fusion center alongside analysts from other Pentagon agencies, including the Defense Intelligence Agency (DIA) and the National Geospatial-Intelligence Agency (NGA). Support for the fusion center flowed mainly through U.S. Northern Command (NORTHCOM), the regional military command with responsibility for North America, which also staffed the center with three of its own personnel. While the term “high value target” often refers to leaders of terrorist groups or hostile states, highly-sensitive NSA documents disclosed in September 2013 by Brazil’s O Globo show that NSA officials used the same language to refer to the presidents of Mexico and Brazil. Classified briefing slides published by O Globo identified Presidents Enrique Peña Nieto of Mexico and Dilma Rousseff of Brazil as “high-value targets” of the agency’s espionage operations. The Snowden documents have led to a series of disclosures about the spy agency’s operations in Mexico, including that the NSA had intercepted the personal email accounts of Peña Nieto (while a leading presidential candidate) and his predecessor, Felipe Calderón, along with dozens of other world leaders. One report describes how NSA operatives based at the U.S. Embassy in Mexico City were able to hack into the email accounts of Calderón, members of his inner circle, and “several Mexican government agencies.” These “accesses,” under a program known as “project FLATLIQUID,” were “just the beginning,” according to the November 2010 NSA report, first published by Der Spiegel. Another document leaked by Snowden and first published in July by O Globo describes a program called XKeyscore, through which the NSA captured and analyzed global Internet traffic from 150 monitoring sites at U.S. diplomatic posts around the world, including one located in Mexico City. A separate document, also leaked by Snowden, indicates that the U.S. Embassy in Mexico City hosted personnel from the NSA’s Special Collection Service (SCS), a highly-classified, covert NSA program whose mission is to secretly install and monitor listening devices and other espionage equipment aimed at foreign leaders and other sensitive intelligence targets. SCS Mexico City was also a primary recipient of intelligence collected under the FLATLIQUID program. An April 2013 Washington Post article—based primarily on confidential sources—described the increasing role of the Central Intelligence Agency (CIA) and Drug Enforcement Administration (DEA) in the operation of joint intelligence “fusion centers” with the Mexican government under Calderón. These facilities, staffed by both U.S. and Mexican officials, were intended to facilitate information sharing between the two countries. Unlike the joint fusion centers described in these earlier reports, the facility outlined in the DOD memo is a U.S.-only operation and was focused on the most sensitive intelligence targets. 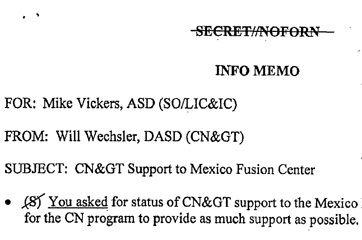 Among other kinds of support provided to the Mexico Fusion Center, the Wechsler memo lists the installation of computers linked to both SIPRNet (Secret Internet Protocol Router Network) and JWICS (Joint Worldwide Intelligence Communications System). These are the same classified DOD intelligence networks allegedly exploited by Snowden and, before him, Chelsea Manning (formerly Bradley Manning), who was the source of much of the information disclosed by WikiLeaks. “Indirect support” for the center included the installation of a Combined Enterprise Regional Information Exchange System (CENTRIXS) “for secure communications between U.S. and Mexican military forces.” In May of this year, journalist Raúl Olmos of AM de León, wrote about the Wechsler memo as well as a Mexican Navy (SEMAR) document that discussed U.S.-Mexico information sharing through CENTRIXS. The SEMAR document also discussed the use of drones supplied by the U.S. through the Mérida Initiative. The NORTHCOM documents also confirm that U.S. intelligence programs in Mexico rely on intelligence analysts and programs previously assigned to the war in Afghanistan. The Archive received the NORTHCOM reports in response to a FOIA request for records related to the decision by the DOD in 2011 to “reassign specialists who had previously been working on Al Qaeda intelligence to work on Mexican drug network projects.” Anthony Wayne, the current U.S. Ambassador to Mexico who replaced Pascual after he resigned in the wake of the WikiLeaks scandal, also served previously as deputy ambassador to Afghanistan. Department of Homeland Security (DHS) officials were also involved in sharing information with their Mexican counterparts through their own fusion centers, which was a topic of discussion between former DHS Secretary Janet Napolitano and high-level Mexican officials in March 2010. Migration Declassified is a project of the National Security Archive that works to support the rights of migrants in North America by increasing transparency around security and law enforcement institutions in Mexico and the United States. Among other things, the project aims to shed light on U.S. intelligence and espionage programs, especially those related to the authorization of surveillance operations, the selection of surveillance targets, and the utilization and handling of intelligence information, in accordance with international human rights law and standards. These were recently summarized in a set of Global Principles on National Security and the Right to Information, drafted by 22 civil society organizations and facilitated by the Open Society Justice Initiative. This post was co-authored by Michael Evans and Jesse Franzblau and was originally posted at Migration Declassified. What could go wrong? Right?